Wisconsin tangler Linda Dawson has shared several very popular tangle patterns with us and she’s back today with Ozzie. Linda is fond of using Maria’s “grid seed” technique for developing tangles. Ozzie makes use of the effect of alternation where a visual rhythm is created within a pattern by alternating the black and white spaces. 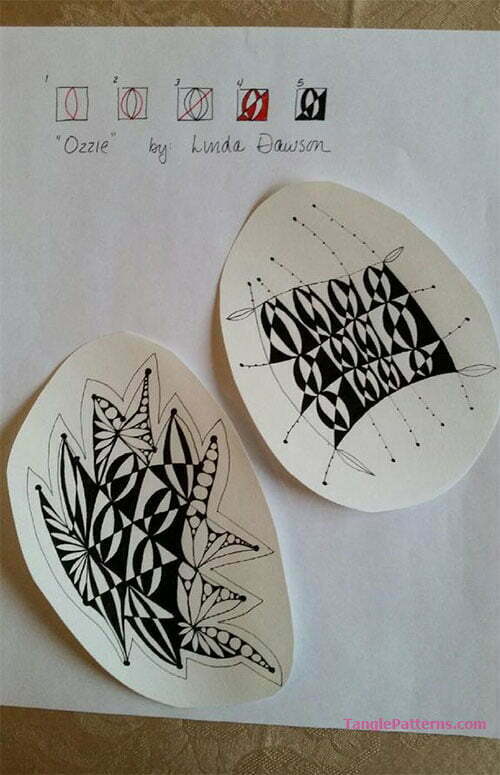 Linda illustrates the step-by-step instructions for drawing Ozzie here and she includes two Zentangle®-inspired pieces (literally!) showing Ozzie in some interesting embellished grids. Check out the tag lindad for more of Linda’s tangles on TanglePatterns.com. This is a very sharp looking tangle , it will make everything pop. Oh!! I like this tangle, and will have a go later. Looks like something I could handle as a beginner — thank you! Linda I really like your Ozzie! Just now I grabbed a piece of paper and drew a few of them. Your two examples are great! Thank you for sharing them with us.